Researchers from Boston Children's Hospital and Harvard Medical School inadvertently discovered this after observing that nearly half of all infants in a group who died from SIDS had a unique abnormality in their hippocampus that was not present in infants who died from other other known causes. Based on their observations, it is now believed that this abnormality upsets the brain's ability to regulate breathing and heart rate patterns during sleep, which is when SIDS typically occurs. Though it is widely known that the hippocampus regulates brain-specific functions like memory, learning and spatial orientation, this central region of the brain also regulates breathing and cardiac function. When a structure within the hippocampus known as the dentate gyrus contains double layers of nerve cells instead of the usual single layers, the resulting abnormality, known as focal granule cell bilamination, can lead to sudden death for reasons that may not be initially apparent. "The pattern of abnormal changes in the dentate gyrus suggests to us there was a problem in its development at some point in late fetal life or in the months right after birth," explained Dr. Hannah C. Kinney, M.D., lead author of the study. "We didn't see any signs of injury to the brain by low oxygen levels in the tissue we examined, such as scarring and loss of nerve cells." How this relates to vaccines was explained in a 2011 study published in the journal Human & Experimental Toxicology. Since SIDS is the leading cause of death among babies between the ages of one month and one year, something common but most likely overlooked during its victims' normal developmental period is clearly to blame, and this common thing appears to be routine childhood vaccinations. A team of independent researchers looked at the infant mortality rate (IMR) around the world and observed a direct relationship between the number of vaccines given and the number of infant deaths. In other words, countries that administer the most vaccines to children during the first year of life were found to have a higher IMR, while countries that are more careful with vaccines were found to have a lower IMR. Interestingly enough, the SIDS study also revealed that the hippocampus abnormalities associated with SIDS tend to emerge right around the time that babies are vaccinated for hepatitis B. 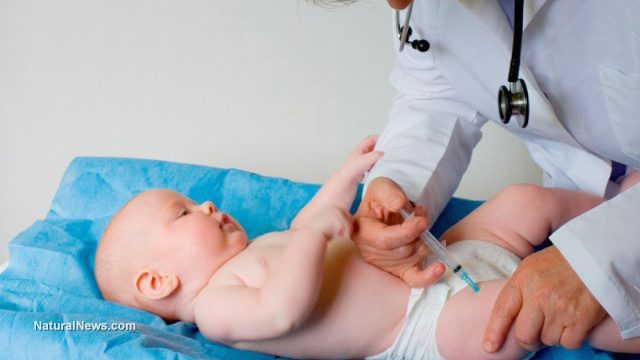 As you may recall, the hepatitis B vaccine is associated with causing seizures and epilepsy in some children, which is often associated with hippocampus abnormalities. This suggests that, at least in some cases, children who are vaccinated for hepatitis B immediately after birth in accordance with U.S. Centers for Disease Control and Prevention (CDC) guidelines experience developmental damage to their hippocampus, which later leads to sudden death.